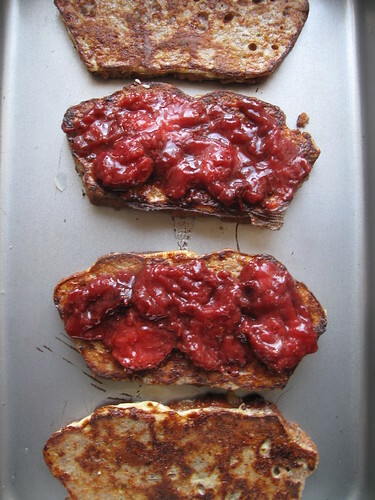 I love French toast, but it sometimes gets so boring (a fact my husband will attest to) that I practically have to force him to have it. 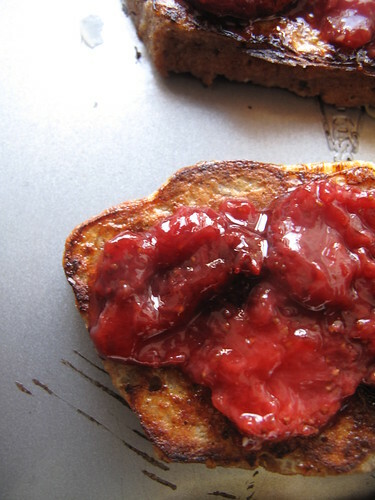 Somehow we’ve managed the occasional variation – encrusted, only lightly dipped in bread as we both hate soggy FT, with jam, and on and on. One day, I sat in the kitchen, jar of lemon curd to one side, almonds to the other and light brown sugar within arm’s grasp. 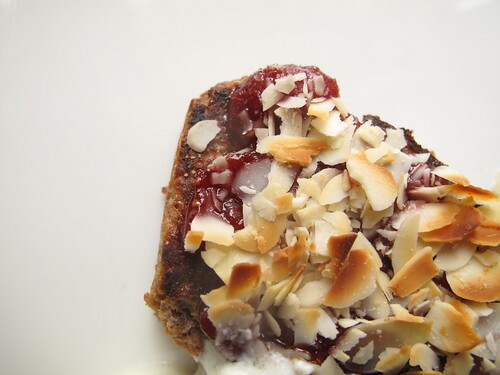 I put them all together and fell in love….with French toast all over again. Well, I’m a girl of crusts and this recipe soothes my soul to a T: the edges crisp up nicely, and while the insides are soft there’s no sogginess about them. 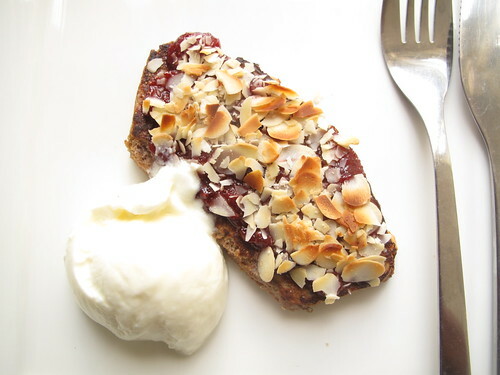 The curd/jam layer add sweetness and spice to an otherwise plain Jane recipe but the star is the almond + sugar combination. When the FTs are toasted under the grill till golden (watch this stage very carefully for it takes mere seconds to go wrong), the topping caramelises and crunches up – very much like ‘the’ creme brulée caramel layer. A recipe that you’ll find hard to mess up. 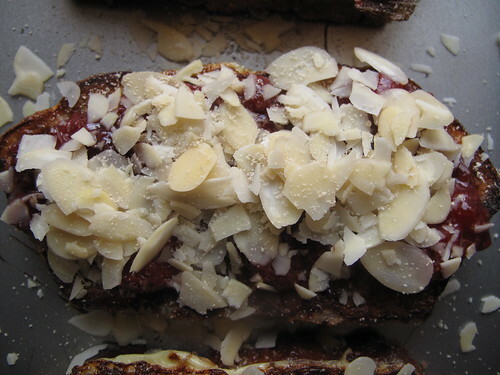 Overall, I love the components – bread, jam and nuts and the coming together. 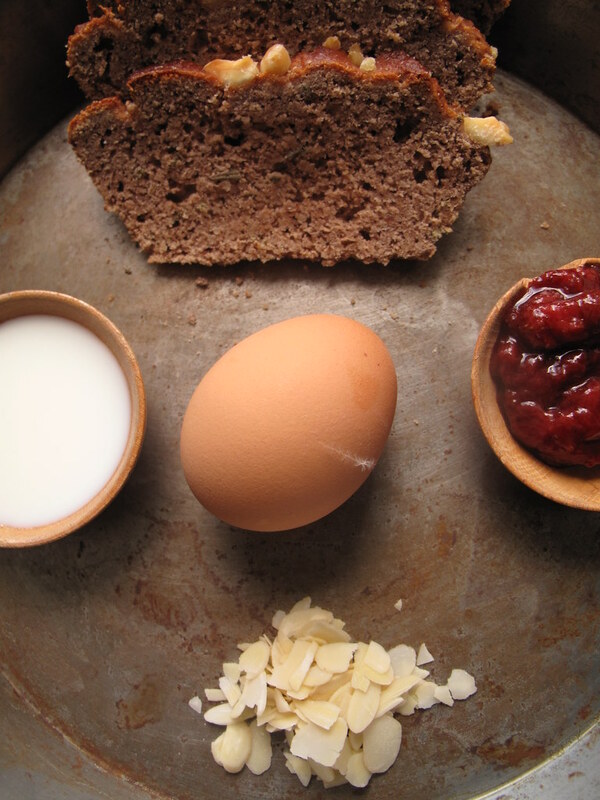 Put the eggs (whites) into a wide, flat-bottomed bowl or plate and add the milk and cinnamon or vanilla powder. Whisk/mix till well combined. Put a pan to heat up on low-medium. 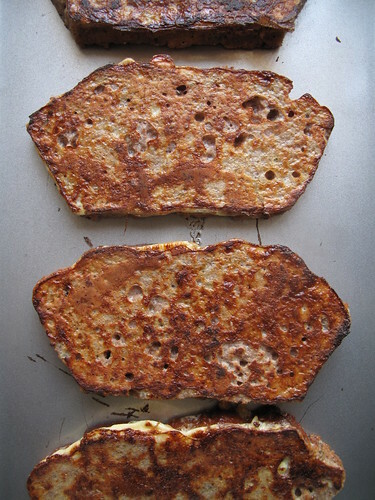 Dip bread into egg mixture on both sides: if you like you french toast a bit dry, this recipe is good for 6 slices of bread and for 4 slices if you like it soft. 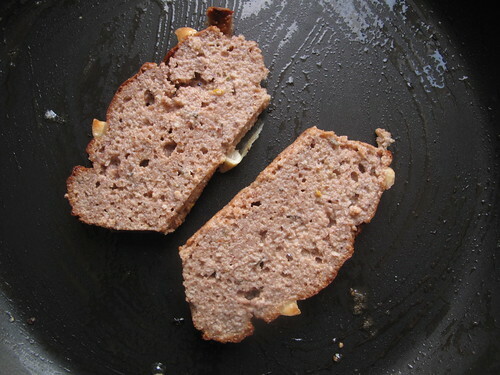 By now, the pan should be hot, using a pastry brush, grease the pan with butter and place the bread in, let brown on both sides, about 2/3 minutes each on low-medium heat, allowing it to cook well. 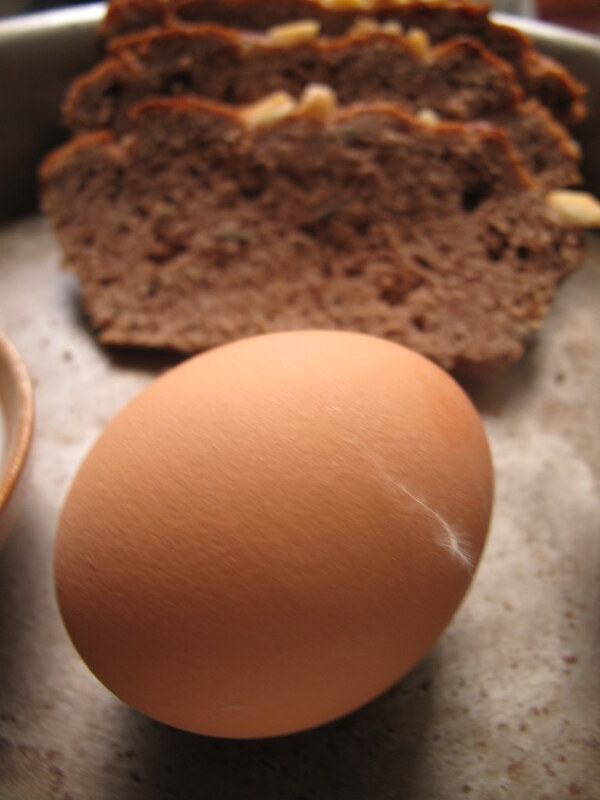 When ready, remove from the pan and set aside. Turn on your grill/broiler to medium. 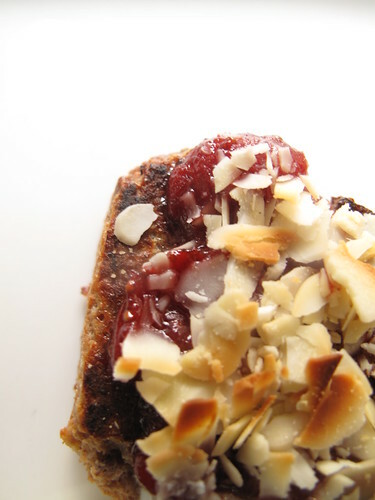 Spread ancho strawberry preserve on each piece of bread, top with some flaked almonds and finish off with a sprinkling of light brown sugar or maple flakes. Set all the ‘finished’ pieces on a baking tray and place two rungs down from the top of the grill, about 6 inches from the heat source. 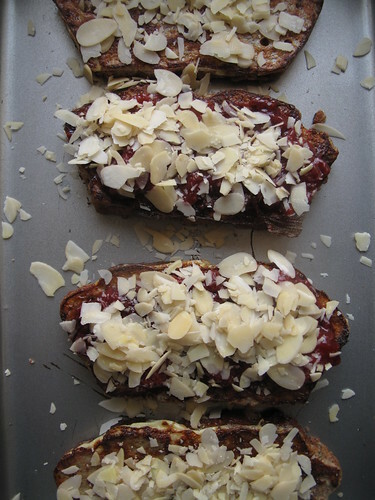 Let grill till almond/sugar turn golden brown, anywhere from a couple of minutes to 3 or 4. 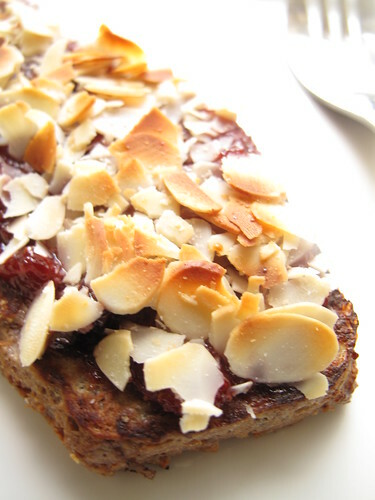 It is ready when the almonds are toasted, the ancho strawberry preserve glistens 🙂 and the sugar just caramelizes (in my case with the maple flakes, the almonds were the key to defining readiness). Remove and serve immediately.